NEW YORK (CNNMoney.com) -- General Motors is set to begin sales of the Chevrolet Volt electric car by the end of this year. But if you have your heart set on buying one, you'd better cool your heels. GM plans to build only 10,000 Volts in 2011. That works out to a selling rate of, at the most, about 835 Volts a month. GM currently sells more Cadillac Escalades than that and it's a fraction of the sales for a popular model like the Chevrolet Malibu, of which GM sold 21,000 last month. In 2012, GM plans to increase production to 30,000 Volts, but even that won't meet demand for the car, said Lyle Dennis, a New Jersey neurologist who runs the blog GM-Volt.com. Dennis's blog, started shortly after the Volt was unveiled as a concept car in early 2007, has allowed people to add their names to a list of potential buyers. That list now has about 53,000 names, Dennis said. While "hand raisers," as such list-signers are called in the industry, don't always translate into real buyers, GM spokesman Rob Peterson agrees that GM almost certainly could sell more Volts than it's producing. Powered by a lithium-ion battery pack, the Volt will be capable of traveling up to 40 miles on purely electric power once it's been fully charged. For driving beyond 40 miles, the Volt will have a four-cylinder gasoline engine that will generate electricity to power the wheels. But, as it enters largely unknown territory, GM is proceeding with extreme caution, he said. "We want to make sure, at the beginning, that everything is right," Peterson said. It's one thing to sell cars, but dealers also have to be prepared to service them. The Volt will also have a new version of GM's OnStar mobile service and those operators need to be prepared to deal with calls that may be unlike those they receive from drivers of other cars. GM also doesn't want to strain suppliers of crucial -- and difficult to produce -- components like batteries, Peterson said. Not only is GM limiting the number of Volts that will be produced and sold during the first year, it's also limiting where the car will be sold. 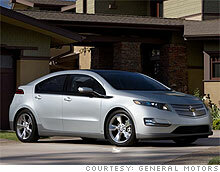 The Volt will initially only be sold in six states and the District of Columbia. For his part, Dennis said, he understands GM's go-slow approach. "This thing is so full of new technology that they're very nervous about just dumping it on the market," he said. Not every automaker is proceeding as slowly. Nissan will be competing against the Volt with its Leaf, a purely electric car with a 100 mile range in city driving, but no option to drive further on gasoline. While Nissan will not provide expected U.S. sales numbers for the Leaf, spokesman Steve Oldham said the automaker expects to have 25,000 paid reservations for the car by the time it goes into production in December. Nissan is not taking reservations that it does not expect to be able to fill within a year, he said. At least in its first generation, the Volt will be more of an image maker than a money maker for GM. Because of its expensive lithium-ion battery technology, it will be years before the car is profitable, GM executives have said. That doesn't mean, however, that Chevrolet dealers won't make money on it. With supplies limited, dealers may sell the Volt for more that its advertised sticker price. That frequently happens when highly anticipated cars are first introduced. Some dealers are already taking deposits on the Volt, even though GM has not yet announced the car's sticker price. That price is widely anticipated to be about $40,000, or about $32,000 after federal tax credits for electric cars. Shadrick Bennett, sales manager at LaFontaine Chevrolet in Dexter, Mich., said he already has as many as eight people on a list waiting for their chance to buy a Volt. His dealership has declined to accept deposits on the car, however, until word comes from GM on how many Volts the dealership will get to sell. "Once I get word on allocation it will be first come, first served," he said. While many dealers will probably charge over list price for the car, Bennet said, he couldn't say whether his own would or not. That decision has yet to be made. Of course, there's also the possibility that demand might not be high as GM anticipates. By ramping up production slowly, Dennis suggested, GM may also be hedging its bets, avoiding the potential embarrassment of unsold Volts sitting on dealer lots. "The last thing they want is to have to discount the Volt," he said.